Play with opposition, from one side of the colour span to the other without stopping in the middle. From very graphic to sleek all over and from big boards to the traditional standard planks. 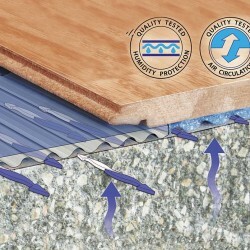 The protective surface ensures the floor’s durability and hygiene. Embossing gives the surface a more realistic texture and allows for sophisticated decorative effects. Made from printed paper, it allows for a wide variety of designs and colours. 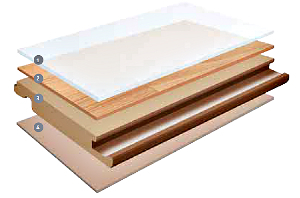 High density fibreboard(>80% wood) provides exceptional structural strength and high resistance. Protects the core board from moisture and guarantees dimensional stability. Tarkett laminate floors come with an easy-to-use and fast click system (2-Lock). Thanks to the floating installation, the floor can be walked on right away, you can also easily remove it without damaging the support. Installation requires minimal preparation work and few tools,and laminate floor can be installed on all type of subfloors. Installation guidelines and video available on our website. High density fiberboard with Techwear technology to resist falling objects, heavy furnitures and daily punishment without a dent. The hard sealed surface is stain resistant and the tight locking system prevents dust and dirt from entering the seams.